So you’d better dress up. And have fun! 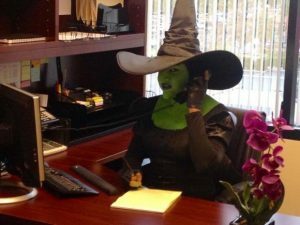 The story I came up with for this prompt begins on just such a day, where all the employees of this generic office company are enjoying their yearly dress up day while still trying to keep up their productivity and avoid getting fired. On this particular year, they’re in for a surprise. Their boss thought it would be a good idea to dress up as Michael Douglas from Falling Down so he could stage an office emergency. He even went so far as to plot a mini shoot-out that would see him quickly go down in a hail of fake bullets and squibs. Unfortunately, what he didn’t account for was that Bob from the mailroom (cliché, I know…what do you expect in five minutes of ideation?) had the same idea, only with real bullets and real blood. Continuing with the Hallowe’en theme of this month, I originally posted this story on 16 Oct. 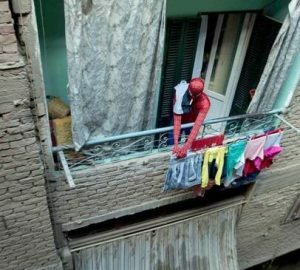 In the picture we have a person dressed up in a Spiderman costume who seems to be hanging laundry from the balcony of an apartment. While smoking. Probably a stretch, but I think it’s safe to say it isn’t Peter Parker under the mask. Which begs the question, who is under the mask? The person in the costume is really into cosplay and uses it to meet people. This inevitably leads to said people coming back to the apartment, where things take a turn for the worse. You see, the person under the Spiderman mask is actually the Cosplay Killer, a murderer who lures people to their apartment to re-enact comic-book killings. The laundry on the balcony actually belonged to one of the victims who’s not quite done yet and that’s where this story picks up. There’s a victim in the apartment who’s still alive, but Spidey makes a mistake and a neighbour sees something odd from the balcony. Will the Cosplay Killer be stopped before another victim is claimed? Or will she be stopped? 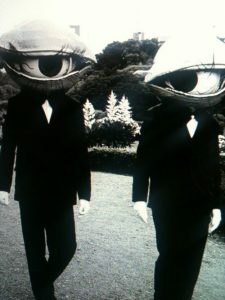 It’s Men in Black, only the men have giant eyeballs where their heads are supposed to be. This prompt reminded me of some pulp novel I read when I was a kid about a bank robbery. In this particular robbery, one of the criminals wore a garish and brightly colored hat to draw attention. The theory, so the story went, was that all the witnesses would focus on the hat and therefore wouldn’t be able to identify any of the other robbers. This prompt struck me as similar, except both individuals are trying out that technique. Trying to be so obvious that all anybody will notice is these giant eyeballs and forget everything else. Why would people go to such lengths? Well, what if they weren’t humans at all? Many of Stephen King’s novels feature a race called the Can-toi, or Low Men, a race of humanlike creatures who work for the Crimson King and who try to fit in when on Earth by pretending to be human. They wear human masks and drive classic American cars and yet for all their efforts, their disguises are just not quite right. Underneath the masks, the Can-toi have rat-heads and they’re generally up to no good, if you can call helping the Crimson King destroy time and space ‘no good.’ I think we can. Are these two individuals Can-toi? Who knows, but I don’t think so. The Can-toi at least try for a human look; these two don’t even go for that which suggests to me that they’re hiding a nature even worse. In the case of my six word story, all I can stay is that we’d better focus on the eyeballs, because were we to look on these two unmasked, we might not survive the experience. So that’s it, hope you enjoyed the explanations for this week. And if you’re curious about one of the stories I’ve tweeted, but haven’t explained, let me know and I’ll add it to the list.